I am Sebastian Ureta and Nicholas has invited me to discuss my new (November 2015) book Assembling Policy. Also, I owe a big thank you to MIT Press for publishing Assembling Policy! For readers of the blog: Given past interest in Foucault, the origins of governmentality, and hybrid infrastructures, I thought the book would be of interest, seeing as how I mix classic STS with governmentality studies (among other things). I’ve published in The Information Society, Social Studies of Science, Organization, Public Understanding of Science, Urban Studies, and a few other places, if you’re curious about other work. The case: I analyze the Transantiago, a mayor infrastructural policy carried out in Santiago, Chile in 2007 with utterly disastrous results. You can see the publisher’s overview bellow. *I am happy to expand/comment on any of the book’s contents — please ask in the comments! Policymakers are regularly confronted by complaints that ordinary people are left out of the planning and managing of complex infrastructure projects. In this book, Sebastián Ureta argues that humans, both individually and collectively, are always at the heart of infrastructure policy; the issue is how they are brought into it. 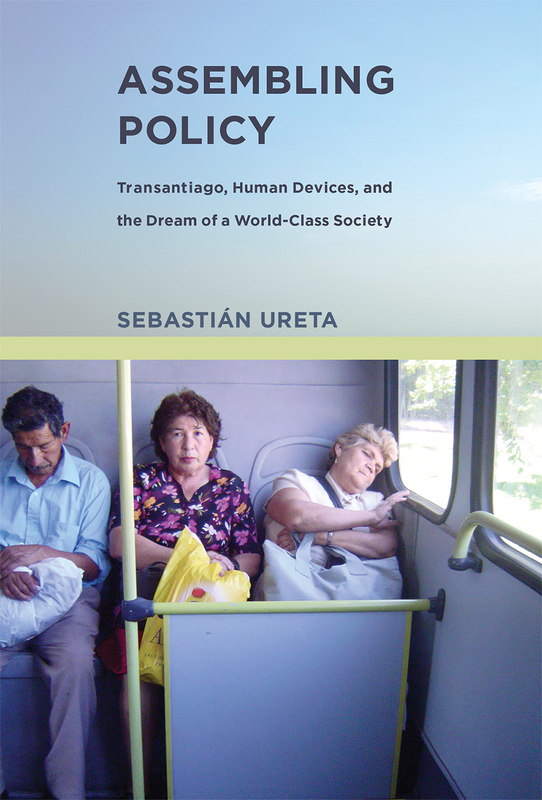 Ureta develops his argument through the case of Transantiago, a massive public transportation project in the city of Santiago, proposed in 2000, launched in 2007, and in 2012 called “the worst public policy ever implemented in our country” by a Chilean government spokesman. Ureta examines Transantiago as a policy assemblage formed by an array of heterogeneous elements—including, crucially, “human devices,” or artifacts and practices through which humans were brought into infrastructure planning and implementation. Ureta traces the design and operation of Transantiago through four configurations: crisis, infrastructuration, disruption, and normalization. In the crisis phase, humans were enacted both as consumers and as participants in the transformation of Santiago into a “world-class” city, but during infrastructuration the “active citizen” went missing. The launch of Transantiago caused huge disruptions, in part because users challenged their role as mere consumers and instead enacted unexpected human devices. Resisting calls for radical reform, policymakers insisted on normalizing Transantiago, transforming it into a permanent failing system. Drawing on Chile’s experience, Ureta argues that if we understand policy as a series of heterogeneous assemblages, infrastructure policymaking would be more inclusive, reflexive, and responsible. This entry was posted in City, Government, Infrastructures in the making, International, STS, Theory, Uncategorized and tagged Chile, Governmentality, MIT Press, Transantiago by sureta. Bookmark the permalink. don’t have access to the new book but took a look at some of the papers that you generously made public and was wondering why not work to remove/end the use of “policy” talk and just lead us instead to focus of the specifics of who is doing what to whom with what and where?